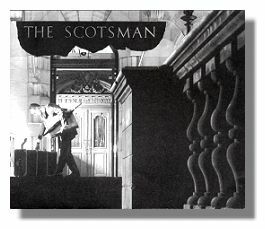 Even before its grand opening, the Leading Hotels of the World group of prestigious properties had included The Scotsman Hotel within its collection for 2001, with a "five star" rating, describing it as "one of the most stylish hotels in the city". This prediction has been proved absolutely correct and over the first six months the hotel has become one of the most desirable places to stay in the city. As a major £19.5 million refurbishment project, the hotel has had a carefully phased development plan, opening first the 56 very individually designed bedrooms and 12 suites, including the split level Penthouse with a private sauna, and a terrace with views across the city. 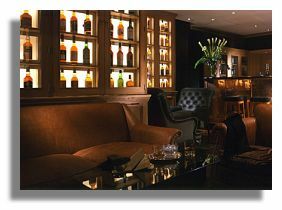 There is very stylish drawing room, a whisky bar and breakfast room. 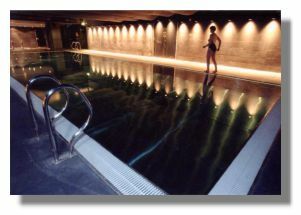 This was followed by the launch in June of the luxurious Escape Spa and Health Club, with a magnificent 16 metre pool created in cool stainless steel. September saw the opening of the North Bridge brasserie for light dining, day or night, with an entrance direct from the street to welcome non-residents as well as hotel guests. There are extensive conference facilities and an intimate cinema for private screenings. Soon to open is the fine dining Club restaurant and there are also plans for a night club. Walking into the elegant black and white tile floored lobby, from the new front door on the north side, (rather than the original newspaper entrance on North Bridge) the ambience is extremely grand. Just before the reception desk are two fabulous red velvet sofas placed either side of an original fireplace. In between is an intriguing glass coffee table, through which are thrust a couple of stone rocks. 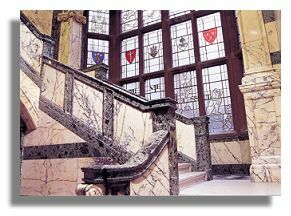 This perhaps is more of a sculptured piece of art, a theme which continues throughout the hotel, especially in the drawing room, just around the corner from the lobby, which features several more tables of a similar design. One in particular might one day find its way to the Scottish National Gallery of Modern Art; this is a long oval glass table within which a wooden carved naked woman is lying reading, as if in a bath, her knees just peeping through the glass "water". Should I dare to put my cup of tea down on this extraordinary and unique piece of art? Yes, you may. All the sofas and chairs in the drawing room are of various designs, upholstered in different fabrics and colours - black, gold and blue - which is a refreshing change from the typical tartan uniform of many Edinburgh hotels. By its very name, the hotel could not ignore its Scottish roots, but this is captured with the use of specially designed Lowland tweeds in sombre, subtle plaids and checks. The famous firm of Johnston's of Elgin was given the commission to re-create fifty different classic tweeds for use in the soft furnishings, chair covers, bedroom curtains, carpets and scatter cushions. Each bedroom is therefore completely different in colouring and design. By the very nature of the old building, with its twisting corridors, curious Gothic copper domed towers, rounded turrets and attic floors, this gave the architects a field day to use the space in an original way for each room. There are different styles of room depending on size and facilities. A standard Study room, a Deluxe Room and an Editors Room. There are Publishers, Directors and Baron suites, all in keeping with newspaper terminology. We stayed in a Publishers Suite on the eighth floor, almost on the roof, with superb views across Princes Street gardens. There is a very spacious L-shaped living room, with television and two armchairs (I would have preferred the sofa from the lobby), then leading off is the dining room area for in-room hospitality. Up two steps is the very cool and calming bedroom, decorated in soft cream and honey colours, a huge king size bed, luxurious bedlinen, and tiny fibre-optic reading lamps on each side of the bed. The shining marble and chrome bathroom is very luxurious, the best quality complimentary toiletries for pampering in a long hot soak in the bath. The designers certainly wish you to feel at home at the Scotsman. There is no mini bar as such but there is a wine rack with full bottles, encouraging guests to drink more presumably. The Cable television also functions as a DVD player, computer with internet access, a keyboard and printer all provided. As part of this in-room technology and entertainment system, there's also a CD player, all housed within the wardrobe in the bedroom. This did not make much sense as we wished to watch TV, play CDs and surf the net while sitting in the lounge not lying on the bed. 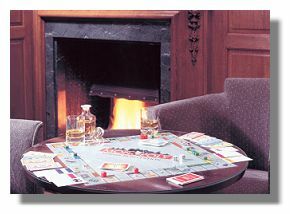 Other entertainment for a rainy day is provided in the form of a Monopoly Board, the Edinburgh version of course, set within a coffee table. There's a great deal of original and fun table design around here we soon observed. 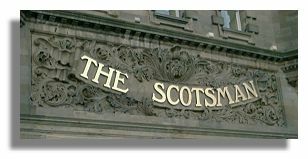 Open to all, guests and people passing by, the new Scotsman Brasserie, is a stunning transformation from the original newspaper marble reception hall. In the centre is an island bar with tiers of glass shelves dangerously holding dozens of bottles. Scattered around the ground floor are tables and private booths in the window recesses. But the piece de resistance is the giant gleaming steel staircase which reaches high up to the gallery mezzanine level, where tables are placed all the way round, offering a terrific view of the giant marble pillars, and of the bar and diners far below. The Scotsman may be a 5 star hotel but this Brasserie is for everyone with extremely reasonable prices for superb, freshly prepared food. You can see it's all very freshly cooked because the open style kitchen is downstairs opposite the bar. Rather than a list of starters and main courses you can within reason select which dish for which course. Sensible thinking. The speciality is Sushi, Sashimi and Tempura each dish especially prepared for you by an expert chef. Also try the tasty crab cakes or a creamy leek soup. A basket of exotic breads, humous and dips is brought to your table immediately which is a thoughtful touch. This is very much a Grill Room, with a wide selection of meat and fish - steak the way you want it, or delicate scallops; then you may choose the kind of sauce or dressing to your taste, as well as your favourite type of mash or fries and vegetables to accompany it. There is a very good range of vegetarian dishes, such as delicious tagliatelle with garlic roasted vegetables which I'm sure even a carnivore would lap up. There is also a good selection of salads, divided into Classic (Waldorf) and New wave (Rocket and parmesan) - all very much in keeping with the architectural blend of the building itself. Classic puddings too such as lemon tart or a succulent carrot cake. After all that, time for a digestif perhaps. Downstairs on the third floor of the hotel, is Room 399, so named because it houses no less than 399 different whiskies, all beautifully arranged in glass cabinets. This is a cosy bar to sit in for a couple of drinks, late at night. "Eat breakfast like a king, lunch like a prince and dinner like a pauper" or so said Adelle Davis. The Scotsman Hotel pride themselves so much in their breakfast menu, that there is a separate Breakfast Room. During the newspaper days this had been the library, file upon file of yellowing back copies. The menu is indeed impressive; There is the full Scotsman, with porridge, eggs, bacon, sausages, black pudding, everything you want; The Healthy Scotsman with cereals, fruit and yoghurts, or most ingeniously, the Flying Scotsman for those that need breakfast to go, a bag with coffee, juice and a bacon roll. On the à la carte menu there are specials such as scrambled eggs with organic smoked salmon, Eggs Benedict, kippers and kidneys. The emphasis is on quality, fresh foods from the real squeezed orange juice, breads and pastries, free range eggs and Ayrshire bacon. And of course there is sure to be copy of the Scotsman available to browse through over your morning feast. After all this good eating and drinking, you may wish to escape and indulge in the luxuries of the Spa and fitness centre, which extends across three floors, deep in the bowels of the building. It is believed that this is where the original printing press was, many years ago and latterly the home for the Scotland on Sunday journalists. There is a spacious air conditioned gym with 60 stations with state of the art technology with interactive systems for personal workout plans. There is an aerobic studio offering all kinds of keep fit and movement classes. The unique stainless steel swimming pool at 16 metres long is an incredible design and with the soft blue lighting it's a perfect place to relax There are saunas, steam rooms, and even Arctic showers to chill out. The Spa also offers every kind of treatment, therapies, massage and aromatherapy for some well deserved body pampering and relaxation within a cool, stress free environment. In the centre of this oasis there is light and airy café, serving fruit drinks and light snacks. With the atmosphere, comfortable seating, loungers, green plants and sunny lighting, it almost feels that you are sitting outside by a Mediterranean beach and pool. Designed by architect David Clarke Associates, the aim was to have a Scottish feel, "without rolling out the tartan carpet." The Scotsman is undoubtedly a hotel with a difference, combining traditional elements such as the original fireplaces and cornicing, blending in with steel, glass and selection of contemporary art and sculpture. The overall unique design, with the emphasis on comfort, is due to the very personal philosophy and imagination of development director, Jonathan Wix who has a clear concept of what a city centre hotel should be like. The opening of the Scotsman Hotel is the culmination of a three year dream for Wix and his team. "When I start I have these mad passionate love affairs with my projects. The conversion has certainly been challenging, with four storeys of the eleven storey building below entry level. I knew there were uses for floors with little daylight, and I put in the health club and nightclub. There was real value in creating them." Six months on, Wix's work is virtually over but he is still involved in witnessing the final completion of the long-term project. "I'm already pretty chuffed," he says "but when guests say they have enjoyed it, that's what I really want to hear." And with an appreciation of the foresight and independent modern minds of William Ritchie and Charles Maclaren, the founders of the Scotsman newspaper, I feel sure they would be delighted to see the title banner still emblazoned in gold on this landmark building. 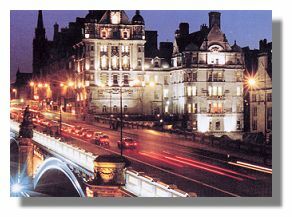 Just as they created a paper of national identity in the 19th century, the name lives on through a grand Edinburgh hotel created with its own stylish and modern identity for the 21st century .